An estranged couple reunite for a country break to try and save their relationship against the backdrop of England’s green and pleasant land – too bad they picked the weekend when a zombie infection is spreading far and wide. 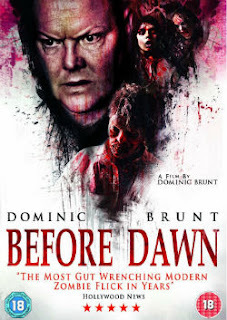 Despite the 28 DAYS LATER-inspired red-eyed, blood-puking, kinetic zombies, this is a small budget home-grown infection-picture that achieves its impact mostly via the accumulation of small, creepy moments and emotionally engaging characters. At the heart of the movie is a credible portrait of two people who should be together, and there’s a bleak commentary on relationships as the outbreak turns them into feral, extreme parodies of what they were like during the worst moments of their marriage. Director / star Dominic Brunt powerfully conveys key moments via phone calls and implication, while making sparing but vivid use of gruesome make-up FX. A modest but dread-laden gem.